Frolicking around the parks is one of my favorite things to do in New York City. Here I am at Union Square Park one fine summer evening. People watching in the parks is a hobby that never gets old. And especially so in NYC. The different types of normality, peculiarity, and diversity of this city can all be seen and consumed within just an hour and even from one spot only. That's what I love most about NYC. That and the fact that I can wear neon pink and leopard together and still feel like I totally fit in. That pink is a nice color. love your skirt!! so beautiful! 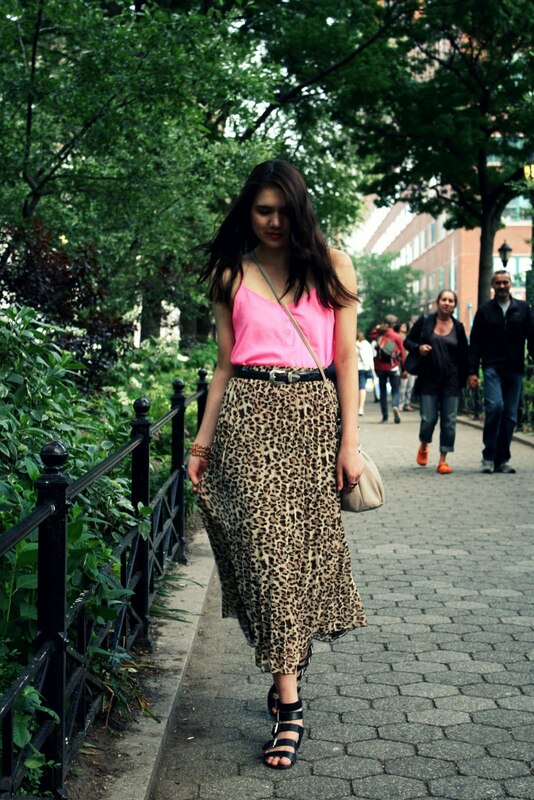 Love the neon pink top with the leopard skirt!!!! This is a great outfit! Love your skirt! Oh, I love this outfit! Because of the length of the skirt the leopard print isn't tacky at all. And what a great shade of pink; it really stands out! OMG, this is co awesome combination!!!! you look so beautiful and chic! LOVE this look! You look amazing in this style top! Just beautiful! i lvoe the leopard print skirt! think im falling in love with the print ahaha! The hot pink + feline print = super cute mix! Looking summer ready, girl! It sounds like you're having such a great time in NYC! Have to admit I'm a bit jealous reading about all of your adventures there. :) And you look absolutely fabulous as usual! Wow the leopard print and the pink match PERFECTLY! That skirt is F21???? GET OUT!!! It looks way too nice to be F21 (not that I don't spend a good chunk of my paychecks there, but I digress). I love the pairing of neon pink and animal print. So fun! i LOVE leopard and neon pink.. you look awesome.. stay cool! I LOVE this look, Dylana! 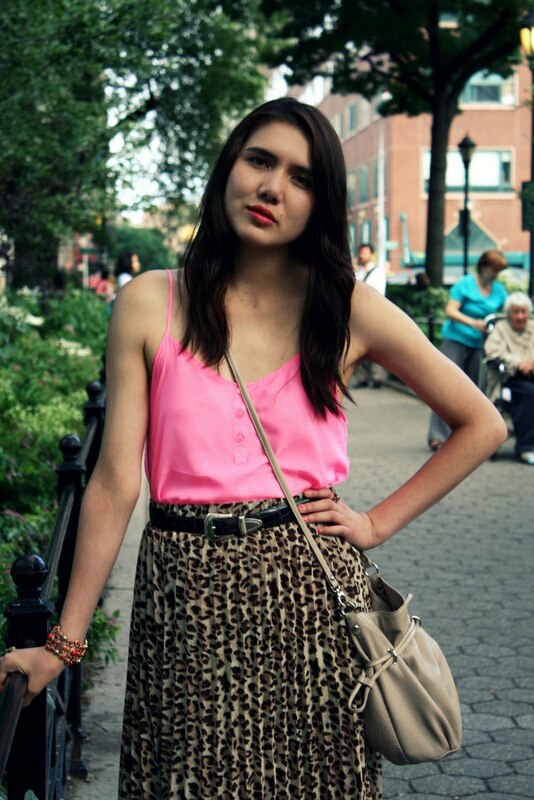 That skirt is AMAZING, and the leopard looks great with your neon tank... SO. GOOD. This combination looks so great!! te ves tan adorable!! me enamo´re de la falda!! love the neon pink with the leopard! looks great on you! Ohh what a lovely skiirt! Love the pink tank, reminds me of bubblegum, looks so good with the skirt! So cute!! I'm obsessed with this outfit! Love this combination of print and neon. I did something similar a few weeks ago, with a floral maxi skirt though. This rocks girl! I love that neon pink paired with leopard print! And I neeeeeed those shoes on my feet nowww haha. People watching is something I've always loved too. It really never gets old, as long as there are new and unfamiliar faces to be seen ! love the pleated skirt with a neon color! I love the leopard print with the pink shirt, so cool! The contrast between the bright pink and the dark leopard print really makes for an interesting outfit. You look wonderful as usual. Hope you had fun in NY! Pink and leopard print is one of my all time fave combos. this is gorgeous!! I love how you paired neon pink with animal print..Brilliant!! Love it!! AND DYLANA I LOVE THE TOP. I LOVE the leopard/neon pink combination! It's perfect for summer. The locations that you take your pics at are just so pretty! That skirt is RIDICULOUSLY awesome! And with neon pink?! It couldn't get any better. I LOVVVVVVVVVVE neon and leopard together! Perfecto combo babe! And these pics are incredible! Looks like you are havin the best time in NYC! Big hug! Did you know that there's a zoo in Central park? Would love that! PS. there's wicked flea markets on the weekend if you are there 39th and 9th Ave (Hells kitchen) and 24th and 6th Ave. (in the garage!!!) you would LOVVVVVVVE it there!!! Such amazeball finds! As the Man Repeller *all hail* recently said, leopard print 'like brie cheese', goes with everything. Pink and leopard, love it! It's such an amazing city, isn't it? So diverse, so creative. I could relax in the park and scout street style for hours. Love the mix of bright pink with leopard. So fun! I love that pink tank. It looks so very comfortable. And I definitely love the fact that you paired it with a maxi leopard skirt. London is the same when it comes to fashion. You can wear what you want and nobody will bat an eyelid at you! Love pleated skirts and this one is so beautiful!! Love the entire outfit! i am sooo in love with that skirt! it has all the qualities i am obsessed with right now: leopard, pleats, and midi skirts! so jealous...and i agree, people watching is so much fun! Cool combo! I definitely need some park time. love the neon pink top! love this outfit the leopard print with the pink looks amazing so gorgeous! love the pink and leopard together!! my DY! Seems like you forgot about lil' ol Jules since you have your east coast friends now! :( BUMMER! anyway I MISS YOU SO MUCH!! You look stunning love the leopard w/the pink, miss HOT THANG!!! Love the way you mix them. I love your leopard skirt! Wow, great outfit. I love the hot pink and leopard. Wow, what a great skirt! I love the outfit! The skirt is amazing! Flasky colors with cool patterns. I love the pink and leopard combination! Enter my Stella & Dot Giveaway! I love the combination animal print + pink! you look beautiful as always! Love the shape of the whole outfit, I'm in love with those pleats! i love the pink and leopard combo, and it looks good on you! ***And if you love vintage clothing at all, you should visit a new site that is launching today, Thrifted & Modern, which features one of the best collections of vintage to ever grace the Internet. See what we have in store, I promise you and your closet will not be disappointed! I love the way you paired the silky hot pink tank with the printed skirt! For all the reasons you just described, I want to come live in new york too!! Im totally diggin this outfit! girl you look gorg! Lovely color and pattern combo. Loving your outfit! You look fabulous!! Completely in love with this outfit. That second photo is so cute! And I love the pop of pink. Anything pink makes me happy! so, ya, i can't really be mad at your for having this skirt but i am certainly a jealous jes. at least someone i like as able to purchase and this and take advantage of it. sorry to vent. oh my god..i LOVE this outfit! I have the same skirt, it looks great with that pink. love love the colour of yout top! I agree with you so much! I visited Ny last month and it was great all the diversity of looks that you can find, and that no one really cares what you are using, you are realy free! LOve the leopard with the hot pink! Amazing outfit..
That and the fact that I can wear neon pink and leopard edpillsbritain.com together and still feel like I totally fit in.